This year, Amy Adams was nominated for her third Oscar for her against-type performance in The Fighter. With this movie, it seemed that she had the world at her feet: she's just about overdue for an Oscar already, she's worked for some brilliant directors and she's always the best thing about every movie she is in. But let's take a look at Amy Adams before she was a big Oscar nominee, on the cusp of international stardom and having all of these opportunities to work with some amazing people. In 2005, Junebug, a little indie flick came out, and from then on, people became aware of just how brilliant Amy is. So much so that she got her first Oscar nomination, for her brilliant performance as heavily pregnant Ashley, a part of the family which British art dealer Madeleine (Embeth Davidtz) marries into. Junebug is all about family and their dynamics, but it also deals with 'outsider art' too. Madeleine's job is to go and find odd art, which is how she meets her husband George (Alessandro Nivola). After being married for a little while, it is time for Madeleine to meet George's parents, and coincidentally secure a deal with an artist. 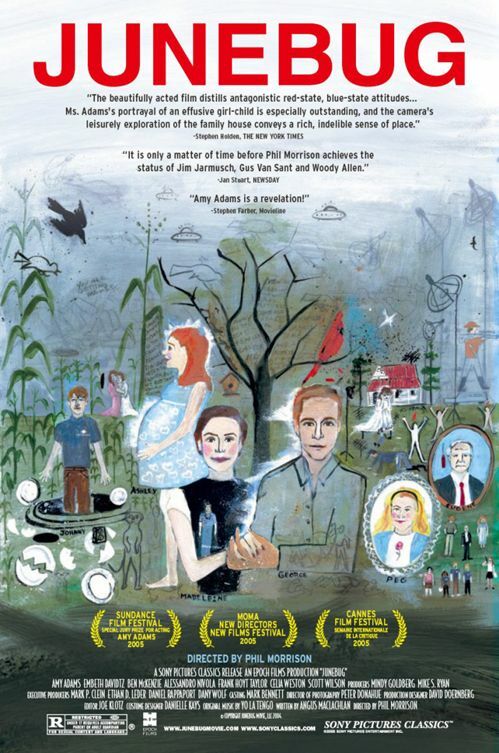 They travel into the deep South and Madeleine has her mind set on getting this artist, even though George just wants her to meet his family: his parents Eugene (Scott Wilson) and Peg (Celia Weston), his high school drop-out brother Johnny (Ben McKenzie) and his pregnant wife, Ashley. Madeleine is instead drawn into all of these social gatherings within her time with the family, and has to rely on Ashley to help her navigate through the baby showers and family dinners. In a normal film, there wouldn't be any room just to observe a family stuck in a small town. No, that would have to have proper plot structure, major tragedy right from the get-go and, heaven forbid, explosions. But even without these, Junebug is a totally engaging indie drama, with a pretty tragic ending which turns both ambiguous and hopeful just before the credits roll. To some people, there might not be any 'point' to Junebug, and that, to an extent, is true. But I found it totally fascinating to watch this family work together, just doing family sorts of things. Also, there's this subtle war between family and work underlying the whole thing, which is wildly interesting to observe. Otherwise, Junebug is just your normal indie, backed by an eclectic sounding soundtrack, set within the confines of an authentic and old looking house, all about people being suffocated by their small town life. You know, nothing 'special', but Junebug is another reason why indie dramas are the best. As a typical indie drama goes, the performances are usually all very good. Junebug is no exception to that rule. Embeth Davidtz is brilliant in her slightly cruel-to-be-kind sort of role. Alessandro Nivola had a pretty normal character, in comparison with everyone else, but I really came to like him in the end, especially in the scene where Ashley breaks down and he's there to comfort her. The parents, Scott Wilson and Celia Weston, were very believable Southern parents, the latter trying so hard to tolerate Ashley and the former just trying to tolerate life. However, I thought that the film belonged to Ben McKenzie and Amy Adams. I remember McKenzie from back in the day when I was obsessed with The OC, and I was pretty surprised when I saw that he has been in hardly anything since then. Here he plays the under-achieving brother, forever in the shadow of his more successful brother, finding his wife just a tad annoying. You name a problem, he most likely has it. McKenzie was brilliant in this role, which made me sad that he hasn't got any more good roles after this one. However, the Oscar nomination speaks for itself: Amy Adams was awesome in this film. She's like a child, with the way her family treats her and the way that she pushes herself onto everyone else. Her non-stop talking does get pretty annoying after a while, but it was interesting to see her finally take off her positive facade at the end, as Amy played this really well. See the film just for her. Well, as long as you like indie dramas, you should be right. THE VERDICT: Amy Adams delivers an amazing performance in this artsy indie, which goes right into the South to show just a normal weekend with a family. It's engaging and well performed, a definite must see for any fans of the genre. If you would like to see Ben Mckenzie in other things, please watch Southland. Mckenzie is one of the leads and he's very good. The series airs on TNT and 23 episodes have been broadcast. New episodes will air January of next year. He was also in a play on film version of Johnny Got His Gun. Amy Adams is an incredible actress, one deserving of an Oscar. I plan on watching The Fighter tonight with high expectations. This film does look good as well, i'll look into it. Anonymous - I'll be sure to check it out if it ever airs here! Matt - Thanks! I love her dearly, she's my favourite actress. I hope you liked The Fighter...she was brilliant in it!